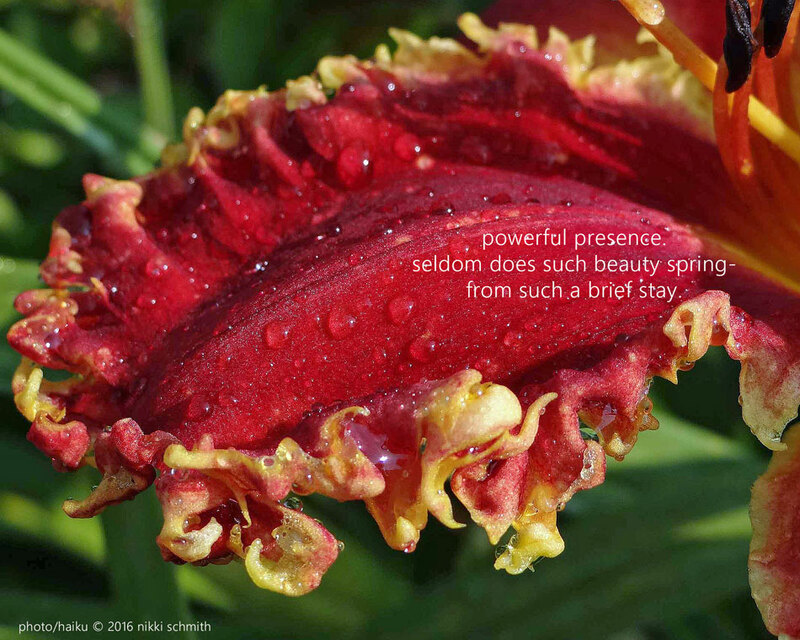 Showing off today in Daylily Haiku Thursday is one of the few red daylilies I love, and it's Mike Holmes' H. 'Happy Holidays to You.' I have grown it into a large clump, moved it three states, and hardly ever offer it for sale because I cannot bear the thought of digging up my five year old clump. It's prickly in all the right places and is a nice shade of tomato red. If you grow it, you're also aware it is on the shorter side, but again, so am I. Some garden judges remark when they see it that it is a poor plant due to its blooming so close to the foliage. Certainly it is more desirable in most cases to have the scapes grow at least a foot (or several) above the foliage, but this one has a great face that makes wonderful floating bouquets of blooms on my summer tables and is so macro-photogenic! This last summer I lined ten small glass vases up down my dining table and placed one bloom of this in each vase. It was a gorgeous table runner for a garden club tea that some still mention when I see them now. Now for a little non-daylily fun this week! Another blogger challenged me to widen the scope of what you see from me (ir OF me) each time you visit, and challenged me to let you in a little more than I normally would - connect with you in a different way than just gardening or daylily photography. So, my surprisingly, but painfully introverted self takes a deep breath, and presents to you 25 things that you most likely do not know about me. 1. I have seen all 48 contiguous United States. By car. 2. Our family was built through the miracle of adoption. 3. I am an only child and I have two very cool and successful sisters-in-law that I don’t see often enough. 4. I have been engaged twice. 5. I have lived in 6 different states. 6. I like horseradish. The hotter the better. 7. I am an accredited daylily flower show judge and judge's instructor who travels all over the country judging and entering in exhibition shows. 9. I have had my head shaved. Well, half of it anyway. 11. I love Mardi Gras, Halloween and the 4th of July. 12. I like the smell of amusement parks. 13. I don’t much like escalators. 14. We have been foster parents. 15. I might have a scrapbooking supply problem. 16. I have stayed up all night on the beach. Alone and with others. 17. The scars on my right hand are from a feral, stray cat biting all the way through it. 18. I have a problem with The Food Network. The problem? I watch too much of it. 19. Michigan was not on my life plan, but I miss it now that I am gone. 22. On my journey to a Master’s, I have attended 4 colleges. 23. I have never smoked a cigarette in my life, nor have I ever had a cup of coffee. 24. I have read 12 books written about or by Hillary Clinton. 25. I think if I could go back to any day in my life and start over from there, it would be the first day of high school. Sharing all that makes my skin crawl a bit, but it's part of that collective experience, right? Come on over to Facebook and comment something fun that people in your tribe might not know about you. It was kinda fun and I'm looking forward to hearing from you!